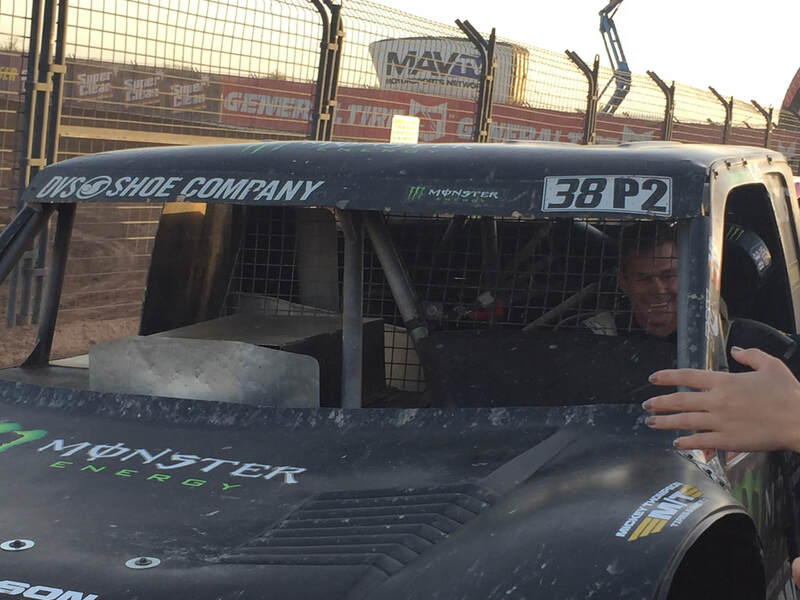 Jeremy McGrath has won the LOORRS Pro 2 Championship!! This year has gone so well for Jeremy, that all he had to do was start the race and do a single lap to seal his first Championship in Pro 2 Offroad! 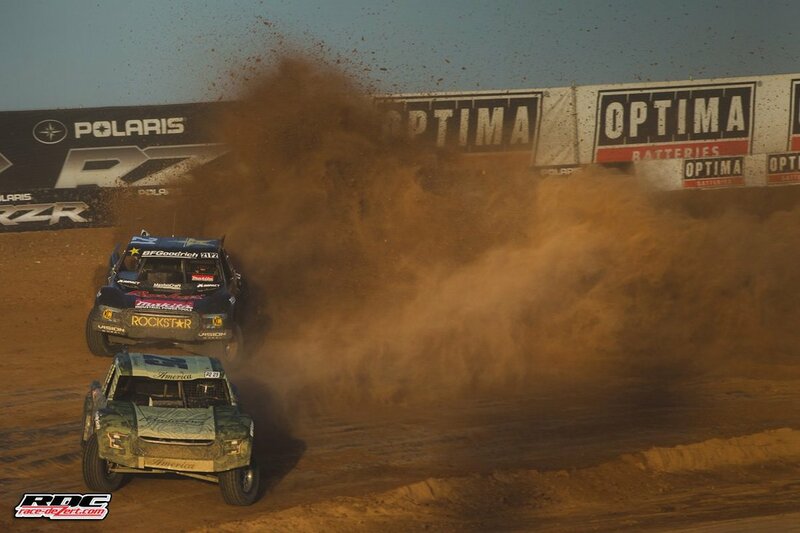 Jeremy's road to the title has been a tough one as the two racers that finished behind him in the championship are the reigning Champions for the last several years, the "General" Brian Deegan and the Legend Rob MacCachren. 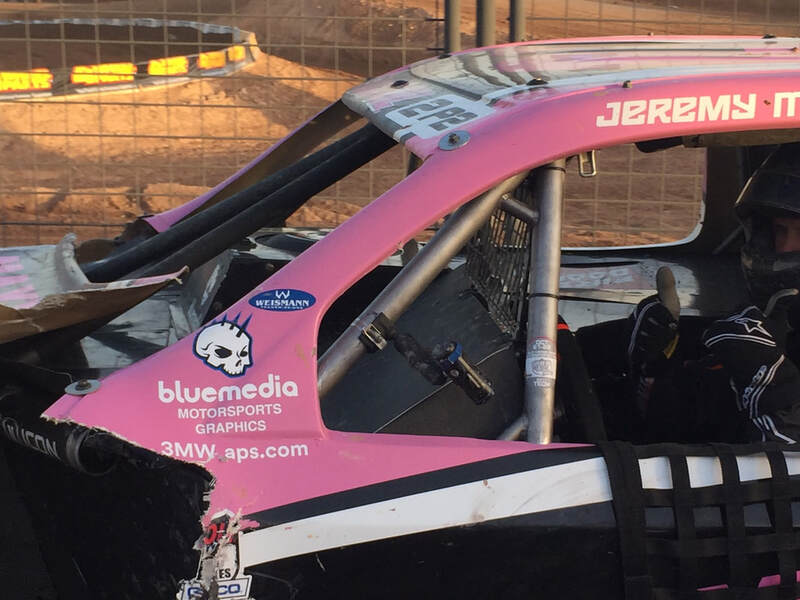 Jeremy had his truck wrapped in pink for the last points race of the season, not only to help raise awareness breast cancer, but to support his family which has been successfully fighting the deadly disease. All team members had pink shirts on as well, but Crew Chief Tanner Stevens wore it best. 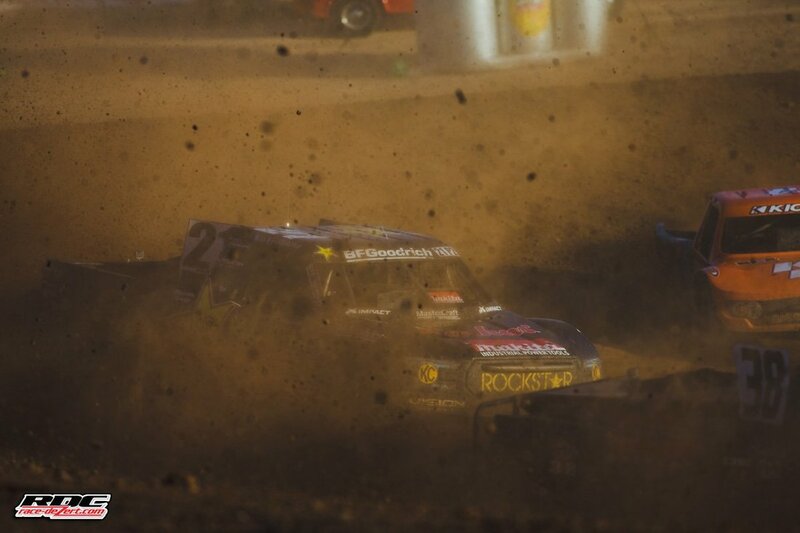 RJ Anderson led Brian Deegan, Patrick Clark, Rob MacCachren, Bradley Morris, and McGrath as the green flag fell. Clark was on a mission to get to the front and quickly took Deegan in turn one and then down the inside of turn two (above), McGrath slipped by Morris for 5th. A couple laps later, debris on the track from the carnage of the opening laps brought out the yellow flag and bunched up the field. On the restart Morris got back by Jeremy and the top 6 ran that way for the next 4 laps until disaster struck and took leader RJ Anderson out of the race and Clark took the lead. Deegan ran wide out of turn three and MacCachren made him pay for that and took second. MacCachren then started to reel the fleeting Clark in. RobMac had almost caught him as they started the last lap, and going into turn three, Rob threw it in sideways from way back and slid right up the inside of Clark who was in the middle of the turn. Door to door they rubbed paint thru the rhythm section, with Clark on the inside into turn 4 narrowly holding the lead. Up onto the bank, RobMac set himself way up high as they approached the final turn and came down the inside of Clark as they hit the final jump on the front straight. MacCachren just went for it and sailed his truck into the sky. Rob Mac flew past Clark but the electronic timing showed that Rob was just .06 seconds behind Clark as they soared across the finish line! After the dust settled, it was Patrick Clark in 1st, MacCachren 2nd, Deegan 3rd, Morris 4th, and new Pro 2 Champ Jeremy McGrath in 5th! An incredible finish to the last race of the year, with Patrick Clark netting fast lap of the race and a well earned first win of the year! 7X Race Champion Jeremy is truly one of the most genuinely, descent people involved in Offroad racing. The sport is lucky to have him as their Pro2 Champion for 2017! We want to thank all the teams that put their trust in our B2T Underdrive, known to some as the Wunderdrive. As nearly the whole field is running it now, it is a given that we are going to win the Championship every year. But we have not rested in on our laurels, and we continually look to refine the design and ensure that we have no failures and enable the racers to race with the confidence knowing that our products won't break!